alan hitt: The Eventually Good News? For a lot of us in the Christian community, we are on our annual Lenten journey toward Easter and celebration of the Resurrection of Jesus, and the new life that makes available to all of us by grace through faith. Easter is the thing that sets Christianity apart from all other faiths. Jesus, the one who started the Christian faith, did something that no other founder of any other major religion ever did. He claimed to be God. Then he did what it seemed could not be done if he were God. He died. But because he was God, he did not stay dead. Easter is a celebration of that first resurrection which lets us know that new life has come to us in Jesus Christ. But new life for what? New life for heaven? Well, yes, but that's just part of it. Jesus launched his public ministry by saying that the Good News consisted of this message - "The Kingdom of God is among you." It's here! It's already here!! It's full realization will be seen on the other side of this life one day, but that does not mean we have to wait one minute beyond THIS day to know life - overflowing, forgiven, abundant, set-free, joy-filled, power-infused, mission-driven life! It's all here, and ready for you to begin living right now! No waiting!! Jesus taught us to pray by telling us to say, "Thy Kingdom come, Thy will be done on earth as it is in heaven." In other words, we should expect that we are able, by God's grace and the power of the Holy Spirit working in us, to appropriate the reality of heaven and bring it to bear right here where we live in Melissa, North Collin County and beyond. Jesus expected us to pray for life as it was meant to be, and for this life to be lived out in the here and now. He clearly believed this kind of life was possible, and even expected, for those who followed him. Way too often I hear well-churched people say something like, "Well this life is just so full of troubles and hardships that there is nothing we can do, so we just have to wait until Jesus takes us home and all our trials will be over." I want to scream back at them, "WHAT?!?! Have you never read the Gospels?!" The Good News is not the Eventually Good News. It is good right now! In Jesus Christ, you are forgiven. In Jesus Christ, you are loved and blessed and equipped to begin living an abundant life today - no waiting, no entrance exam, no testing required. The invitation is to accept Christ, the forgiveness he has extended, and then allow him to begin leading your life today. The new life is here and available right now, today. All you have to do is say "yes," and then begin living into that divine "yes." Now, what does that mean? What does "living into the divine 'yes'" mean? Everything! It means giving everything you are and everything you dream of becoming to Christ, and begin living into his dream for you as a member of this glorious community called the Kingdom of God. 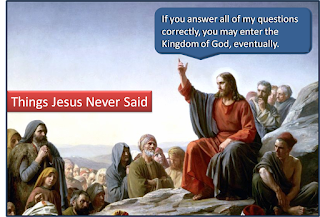 You see, if getting into heaven simply meant the ability to answer the belief questions correctly, every devil in the universe could get in. Living into the divine yes means saying "yes" not just with your words, but with everything about you. You do not talk your way into life. You live your way into life. You die (to sin and to self), are reborn, and you live your way into life. But we do it only by God's grace. We have no ability on our own to pull this off. Thanks be to God for the grace that is ours through the atoning death and resurrection of Jesus! So now, go live. May God's grace so wrap you up in his love that no other way of life seems either interesting or possible. May the forgiveness you experience be so complete that you cannot sit still until you have completely forgiven all others. May the hope that fills your heart overflow in such way that the runoff floods the people around you. And may the life you live in this and every other moment, be a life of irrepressible and abundant joy as you live it in Christ.